This probably came about due to my many years of loyal service as a Hogi Yogi employee in high school and college, but I think having a premeasured and frozen puck of yogurt handy for our morning smoothies greatly simplifies the process of making a healthy and delicious breakfast. 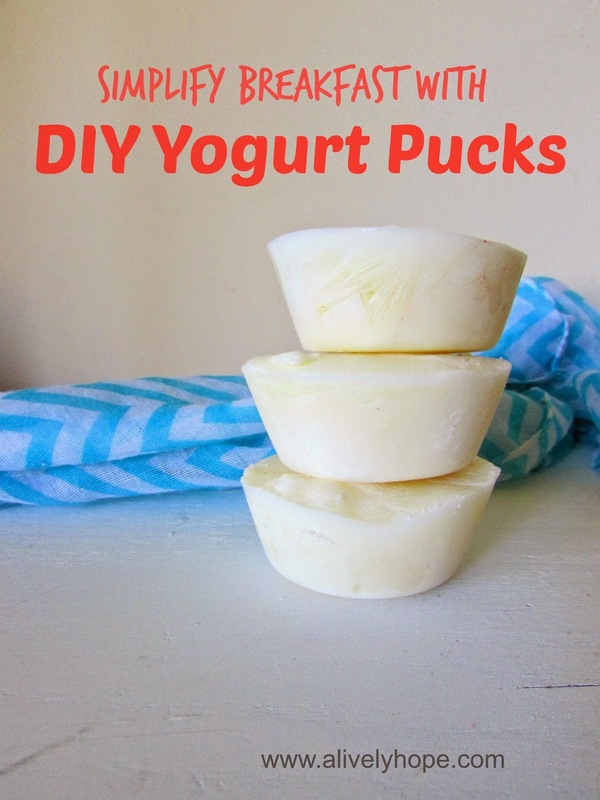 I love this homemade yogurt recipe. It's incredibly simple and uses the crock pot (two of my favorite things!) I make a double batch of this yogurt once to twice a month and then freeze 1/4 C scoops in muffin tins. I have used both silicon and metal muffin tins and they both work like a charm. Once the yogurt is frozen I pop it out of the muffin tin and add it to a homemade smoothie kit (a ziplock bag full of frozen fruit and/or veggies) so all I have to do is dump the bag in the blender, add water, and my breakfast is done. Of course, you don't have to use homemade yogurt. Store bought (or "boughten", as Laura Ingalls would say) would work just as well. How do you simplify breakfast?